Ani's Book Abyss: Read-a-thon: 24in48 January 2017 Starts Now! Read-a-thon: 24in48 January 2017 Starts Now! At least for me it starts right now. I'm early by an hour, but I'm in a big reading mood tonight... well, if I can wrench myself from my computer for a while. But 24in48 begins, I've got snacks and drinks and wine and chocolate, and I've got a couple reading nooks to choose from for the next 48 hours. I'm even considering a nice outdoor reading session with a nice lunch when the afternoon rolls around. In the meantime, my tentatively planned reading for this weekend has taken a bit of a change. I didn't finish certain books I'd been hoping to finish before the weekend, and so I had to make some rearrangements of my reading schedule. I am really getting into Spider's Bite as well as The Search. 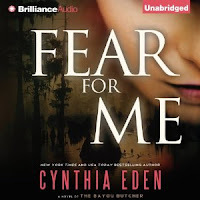 Fear for Me is a nice distraction while I'm trying to multitask, but truth be told, the For Me series, so far is certainly not Cynthia Eden's best work, suspenseful and spine-chilling as the book has been so far. I'm hoping to be able to finish Spider's Bite this weekend, and maybe get a little further into The Search. What I really, really hope to be able to do is start reading one of the following books. Although, at this point, I haven't quite decided which one I want to start yet. And then on top of that, I've been distracted, so there's even the question of whether or not I will finish enough of my other books to reasonably start a new book without feeling guilty about it... Right?